A young family’s new home celebrates the traditional 1920’s villa form with contrasting contemporary design of additional accommodation. In context with the street’s architectural style, the original dwelling is restored, the main front garden developed, and new fencing placed, while the addition is set to the rear and is largely unread when viewing the premises. The stately old home has the added advantages of modern bathrooms, laundry, robes, skylights and every possible energy efficient modification. Very close collaboration with the client during the course of the works ensured significant contribution to colour, selections and some detailed aspects. The addition is separated from the old dwelling, with a bridge-like connecting link, which appears to span over ponds in the courtyards on either side. The successful contrast of classical and contemporary architectural styles is achievable through this disconnection. The Study just touches the SW corner of the dwelling, as it encloses the western courtyard and presents a northern glazed orientation. The setting back of the new accommodation, including Kitchen, Living, and Dining areas, brings winter solar penetration into living spaces. The form is driven by function, including the desire for a mezzanine level. 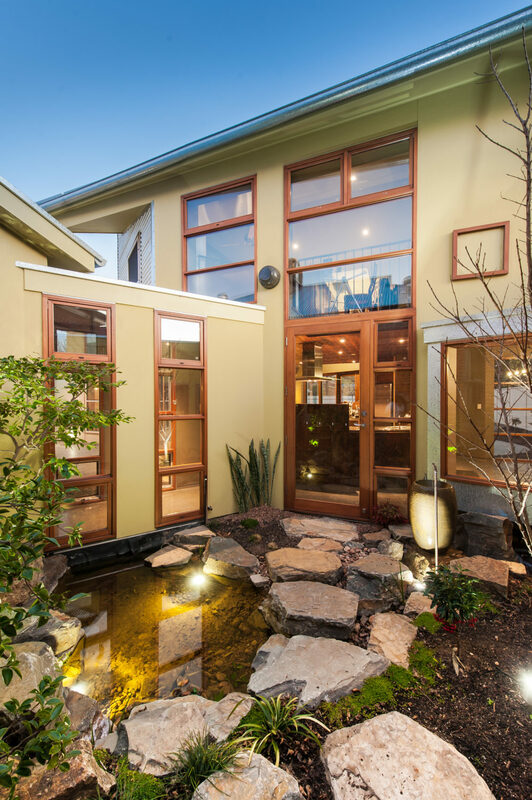 Old and new forms constantly interrelate through view lines across connecting courtyard spaces, mirrored images in window reflections, and discreet openings that frame landscape and building design elements. 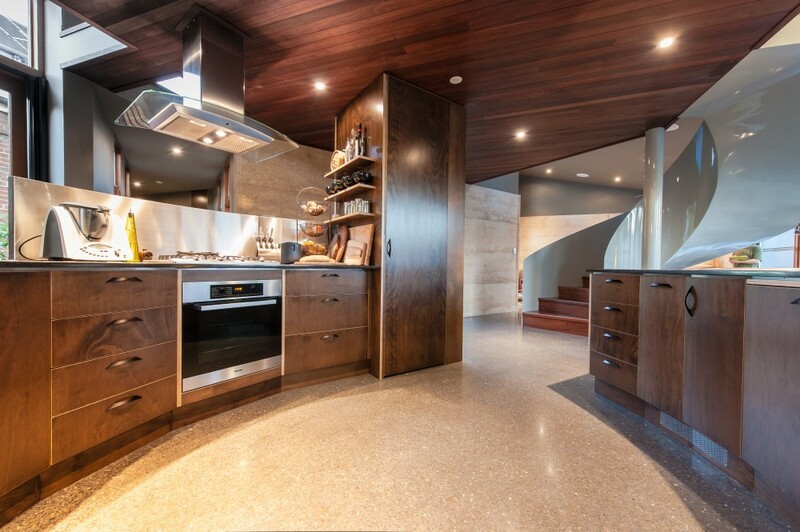 The Kitchen commands a central position and its curved form describes a heart around which family life flows in every direction, including upward, through a crafted spiral staircase to the mezzanine level. Specialist contribution is visible in the formed spiral stair, executed the design of a sheet steel enclosed set of jarrah treads. 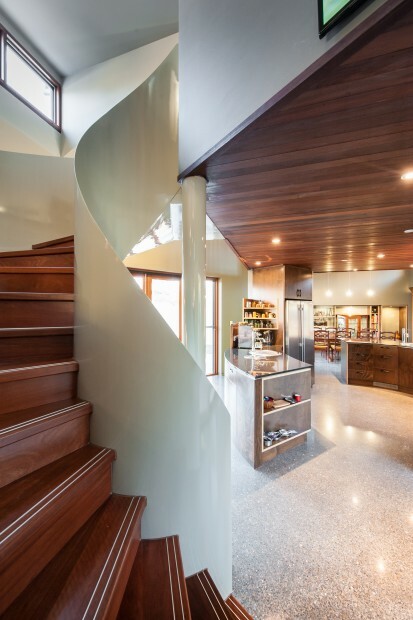 The client contributed a stock of recycled jarrah used in soffit and stair treads. 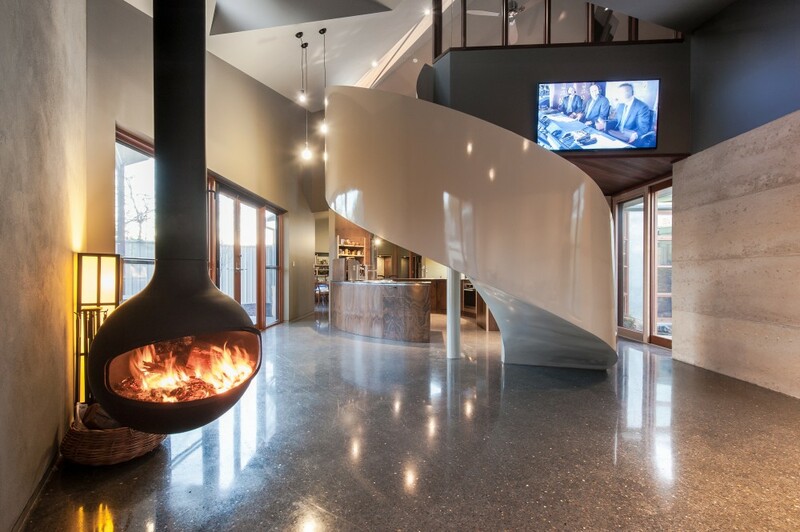 Sustainable design maximises natural winter warmth and summer cool. Elements are integrated to promote air movement; heat capture; rainwater capture, use and re-use; stable indoor temperatures throughout the year; and spaces filled with natural light. 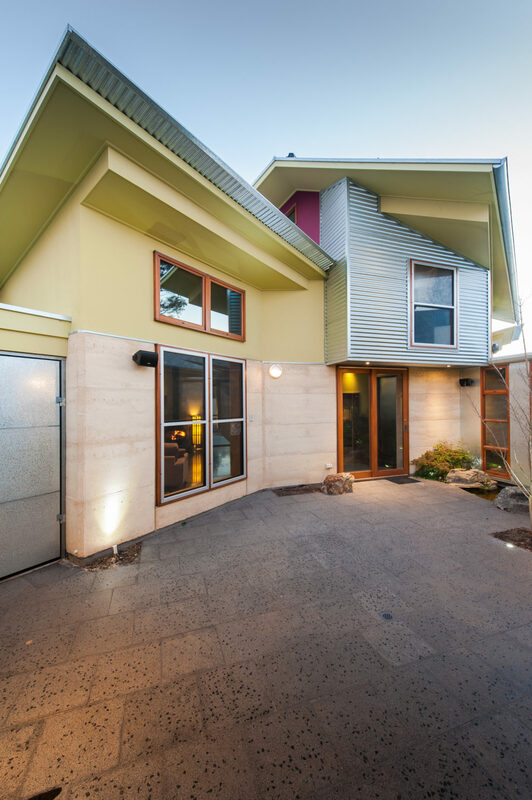 Construction methods combined “reverse brick veneer” walls; high levels of insulation in roof and walls; thermal mass including insulated rammed earth; double glazed windows; orientation for passive solar gain together with courtyard layout; clerestory glazing to enable greater solar access; and shading. Energy efficient technologies include photovoltaic panels; solar evacuated tubes; hydronic in-floor heating; and a Climate Wizard Dry-Cool evaporative cooler, which is connected to an underground cool pipe system, with in floor ductwork delivering air at low level, and distributing through the space displacing warmer air at high level. The entire home is supplied with water from the 60,000 litre underground rainwater tank. A grey water system provides for garden irrigation. Although cost was an issue from the outset, the client had decided to abandon a fully documented design by another architect, and engaged Energy Architecture to produce a building that was seriously designed as “sustainable”. Early budget preferences were exceeded within the design phase, and once documentation was complete further decision-making had driven the budget in excess of $1m.